I had leftover cake batter from my Crock Pot Mini Cake and thought it would be the perfect amount to make some mini cupcakes. I threw in some green food coloring, filled my mini muffin tins, and popped them in the oven. 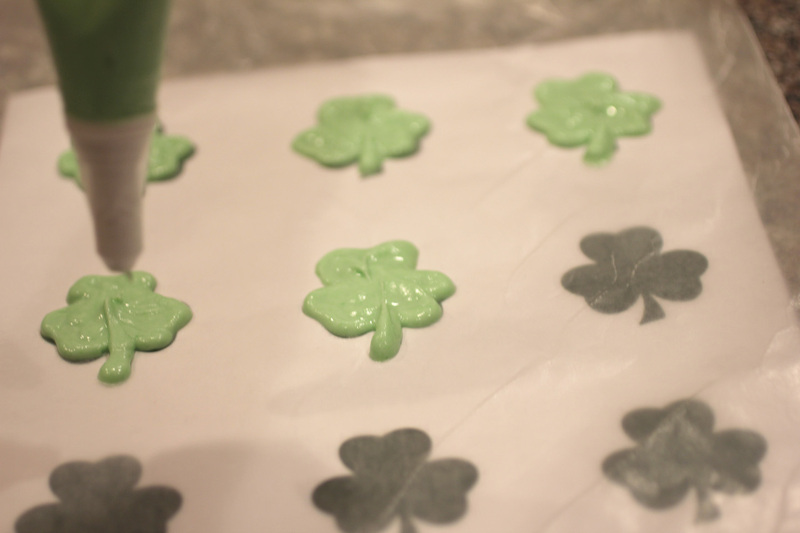 I also had a package of leftover Candiquick from my Crock Pot Candy and decided to use it to make Shamrock cupcake toppers! If you think you need some special cookie cutter for this, you are wrong my friend. This is a very simple tutorial that anyone can do and you could apply it to ANY shape you want! 2. Melt Candiquick according to directions on package. It comes with its own microwavable tray and melts within a minute so don’t let this step scare you away. 3. Add in food coloring to melted Candiquick and stir until you have your desired color. 4. Spoon melted Candiquick into decorating bag or squeeze bottle. 5. 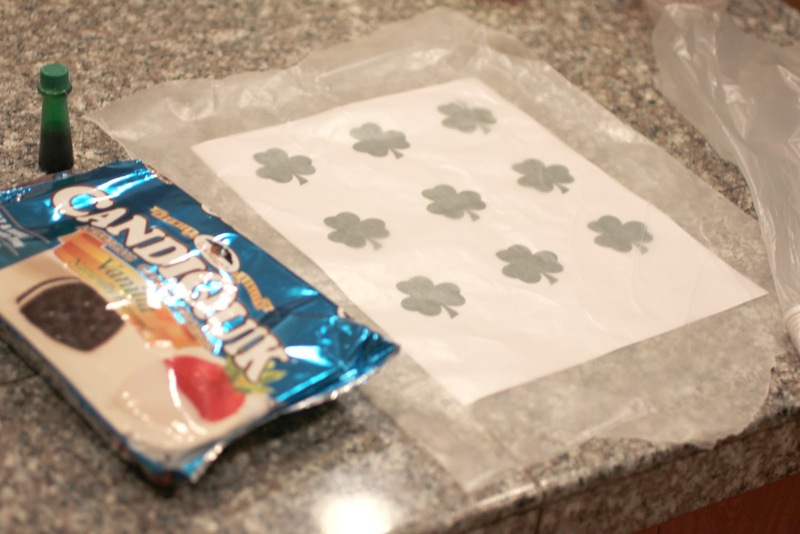 Squeeze melted Candiquick onto the wax paper as you trace and fill in the image. 6. Let cool completely before peeling off of wax paper. Simple as that! Ok, I’m not going to take all the credit for this idea. I found this super neat Green Eggs Candy tutorial over at Random Thoughts of a Supermom which uses the same technique. I've never considered piping like this onto a pattern covered in wax paper. This is brilliant. I do a lot of cakes and cupcakes. What a great idea !!! The finished product looks better than found in any bakery. Thanks for visiting and leaving such a nice comment about my 'Inspiration Board'. 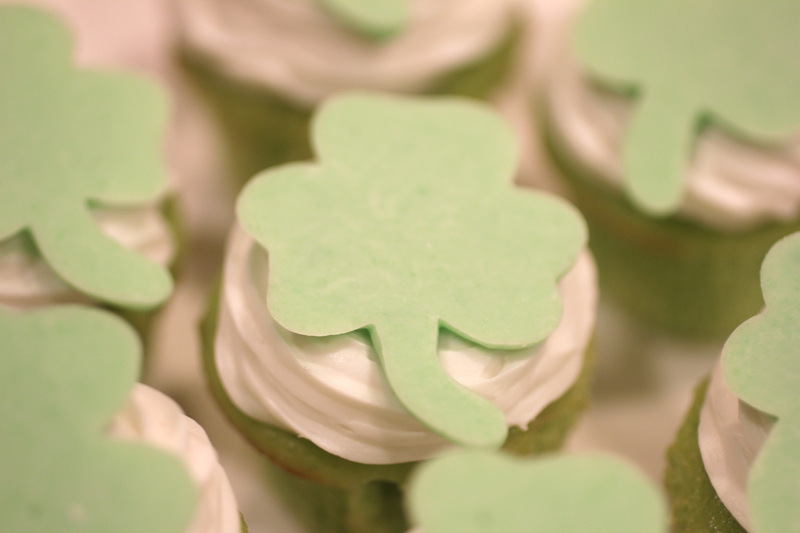 Your cupcakes are the cutest – perfect for St. Patty's Day! Mrs. Delightful and Michelle, It was a pleasure to link up to both of your link parties! I am also happy to be following both of your pages. THANK YOU! i will have to try the candy quick one day we don't have it hear, but I hear great things about it. How cute and creative! I wondered how you did them so perfectly! So glad that you shared it at Things I've Done Thursday!! Wow these are so SO cute! Super festive for st patty's day! LOVE the candy toppers!! Aw, this is so festive, I love it! Just wanted to let you know that I featured this today. Thanks for sharing @ Show & Share. This is such a cute idea! Way to go. I hope you'll link up to my St. Patty's Day Project Parade. Just stopping by to let you know you've been featured and pinned!! 🙂 Thanks for linking up at Tuesday Tutorials, can't wait to see what you link up this week! I'd love it if you'd stop by and link this up at Themed Baker's Sunday. 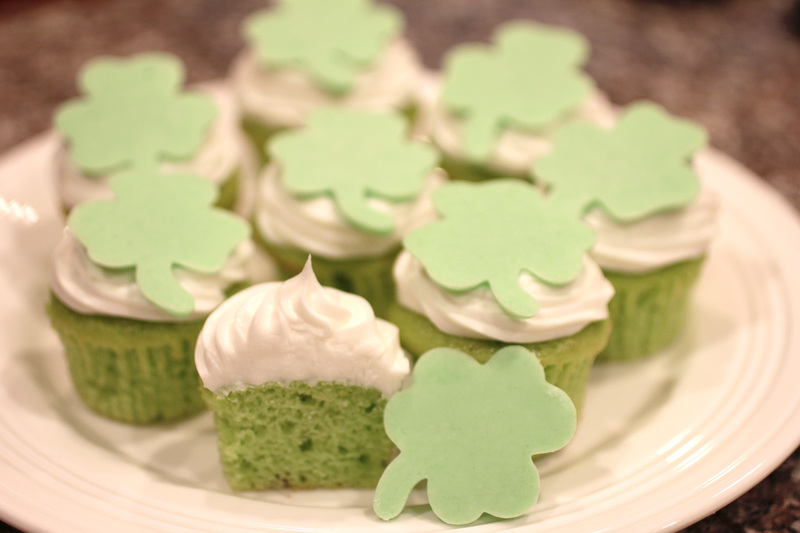 The theme this week is St. Patty's Day treats! So cute and easy! The cupcakes look divine! Wow, I love this, I never knew how to make shapes like this! Thanks for the tutorial!